57 tunes: The Day the Co-Op Flooded (March) * Wha’ Saw The 42nd (Polka) * Mo Ghile Mear (Polka) * The Haughs O’ Cromdale (Polka) * Fest An Hoc’h (March) * Nameless Polka (Polka) * A’ Bhriogais Uallach (The Pompous Trousers - March) * The Barium Meal (Jig) * The Broken Bow (Jig) * Nameless (Jig) * The Edradour Stagger (Jig) * The Mexican Hat Dance (Jig) * The Humours Of Ballyloughlin (Jig) * Old As The Hills (Jig) * The Sound Crew (Jig) * Sweet Rain (Jig) * Atlantic Bridge (Jig) * Tatter Jack Walsh (Jig) * The Reverend Brother’s (Jig) * Trandeiras (Jig) * The Lament For The Coming Of The White Settlers (Piobaireachd) * Thunderstruck / Angus Thing * Marie Madeline (Slow Air) * Full Moon Down Under (Slow Air) * Anada pa Gael (Slow Air) * Charlotte (Slow Air) * Lorient Mornings (Slow Air) * Spanish Thing (Slow Air) * Mairi Bheag From Uist (Whistle - Slow Air) * Muineira De Poio (Dance) * Suite de Gavottes Pourlet (Dance) * Smeseno Horo (Dance) * Pipe Major Graeme Hood (Reel) * The Crowdfunder (Reel) * Niamh’s Capers (Reel) * The Road To The Aisle (Reel) * Craig’s Pipes (Reel) * The Harris Dance (Reel) * Richard Dwyer’s (Reel) * The Jolly Tinker (Reel) * The Wild Irishman (Reel) * The High Level (Reel) * Trip To Sligo (Reel) * Mrs Crechan’s (Reel) * Madame Bonaparte (Reel) * Lord MacDonald’s (Reel) * Solid Ground (Reel) * McFadden’s (Reel) * McPherson’s (Reel) * Miss Monaghan’s (Reel) * The Ash Plant (Reel) * Irish Reel (Reel) * The Contradiction (Reel) * The Ballintore Fancy (Reel). Featuring the infamous and ever-popular arrangement of AC/DC‘s Thunderstruck amongst the collection, this is a must have for all pipers. The book brings the last of Gordon’s compositions together, and some of his more iconic arrangements of other traditional tunes Gordon made his own. The Gordon Duncan Memorial Trust was set up in 2007 to promote and support traditional music. Book One of Gordon’s compositions was released then and has sold more than 5000 copies since launch. The Trust decided a second collection of Gordon’s missing tunes had to follow. 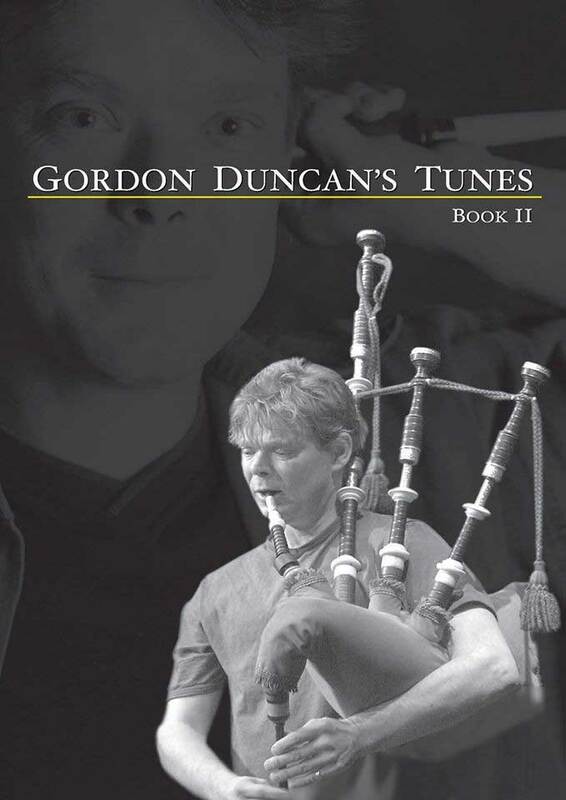 Gordon Duncan’s Tunes Book One is also available.